For those of you not in Brisbane attending IAIA’19, we cordially invite you to join a lively discussion on FRIDAY, April 26, 2019 to learn how lenders, borrowers, and impact assessment practitioners can apply the advances of the International Union for the Conservation of Nature (IUCN) Red List of Ecosystems (RLE) and its 2016 Global Standard for the Identification of Key Biodiversity Areas (KBAs)for the identification and delineation of critical habitats. The presenters will provide an overview of the history of the RLE, the KBA Standard, and the critical habitat criteria as applied by multilateral financial institutions (MFIs), Equator Principles financial institutions (EPFIs), industry, and impact assessment practitioners. The November 2018 revision of the IFC’s Guidance Note 6 on Biodiversity Conservation and Sustainable Management of Living Natural Resources adopts many of the criteria of the RLE and the 2016 KBA Standard. Presently, lenders and private sector borrowers, and companies with high standards for sustainability are focused on the use of GIS-based screening tools, which rely upon the products of the World Database of Protected Areas, the KBA Partnership, IUCN, and BirdLife. However, much of the world’s biodiversity values remain uncatalogued and unmapped. The majority of currently mapped KBAs are Important Bird Areas (IBAs), Ramsar sites, or Alliance for Zero Extinction (AZE) sites, which do not capture many other types of KBAs and do not include threatened ecosystems. The RLE criteria and the KBA Standard provide objective criteria for identifying and delimiting critical habitats that are not currently included in the available datasets. Furthermore, the criteria can also provide a basis for as assessing impacts to biodiversity in terms of “significant conversion” and “measurable adverse impacts”. They also can serve as a means to better achieve mainstreaming of biodiversity into country-level and sector planning and design of development projects. Robert Langstroth, PhD: Robert serves a Senior Biodiversity Specialist in the Inter-American Development Bank’s (IBD) Environmental and Social Safeguards Unit. Robert was formerly an environmental consultant to the IFC, IDB, EPFIs, and their borrowers, and a widely recognized PS6 practitioner with expertise in critical habitat assessments. Improving the accessibility to and quality of biodiversity information and greater clarity and consistency in the standards and policies that drive the environmental performance of development projects globally are goals that drive his professional activities. He holds a MS degree in Range and Wildlands Science from University of California-Davis and a PhD in Geography (specialization in Biogeography) from the University of Wisconsin. He serves on the KBA Consultative Forum and is the IUCN Red List Taxonomic Authority for the Liolaemidae family of lizards. Jon Paul Rodríguez, PhD: Jon Paul is Professor at the Center for Ecology of the Venezuelan Institute for Scientific Investigations (Instituto Venezolano de Investigaciones Científicas ― IVIC), and he is a founder, past Board Member (1987-2001, 2009-2012) and President (2001-2008, 2013-present) of Provita (a Venezuelan conservation NGO established in 1987). His undergraduate degree in biology is from Universidad Central de Venezuela in Caracas (1991). He was then awarded a Fulbright scholarship for a PhD in ecology and evolutionary biology at Princeton University (1999). In addition to Chairing the IUCN Species Survival Commission, Jon Paul was actively involved in the development of the IUCN Red List of Ecosystems, an initiative led by the Commission on Ecosystem Management. His work focuses on understanding patterns in the spatial distribution of threatened species and ecosystems, as well as the underlying causes of these patterns, and the development of policy guidelines for biodiversity conservation. Carlos Zambrana-Torrelio, PhD: Carlos is the Associate Vice President for Conservation and Health at EcoHealth Alliance. Dr. Zambrana-Torrelio works on the intersection between animal and human health. He is particularly interested in how biological diversity, from viruses to ecosystems, respond to anthropogenic gradients (e.g. from forests to cities). Carlos combines quantitative methods from different fields including biodiversity, economics and spatial analysis on his research. He has made significant contributions to the development of the research on ecosystem health, especially as it relates to biodiversity loss, land use change, disease emergence and their economic implications. He has advised the Convention on Biological Diversity (CBD), the Intergovernmental Science-Policy Platform on Biodiversity and Ecosystem Services Intergovernmental Panel of Biodiversity and Ecosystem Services (IPBES), the United Nations – System of Environmental-Economic Accounting (UN-SEEA) on topics linking ecosystems and human health. He is actively involved in the application of the Red List of Ecosystems and he chairs the Human Health and Ecosystem Management Task Force led by the Commission on Ecosystem Management (CEM). 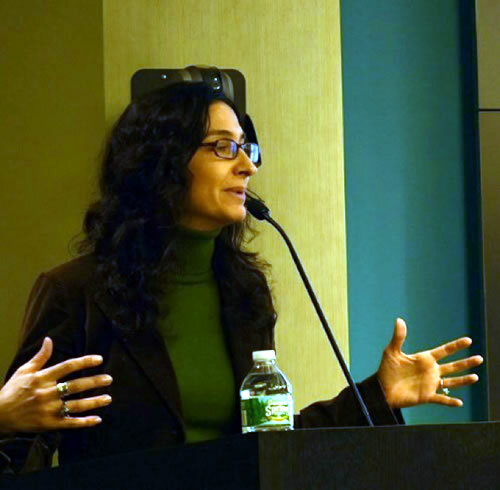 Dr. Zambrana-Torrelio holds a PhD from Sapienza Università di Roma on Environmental and Evolutionary Biology, as well as degrees in Biology and Ecology from Universidad Mayor de San Andres in Bolivia and the University of Puerto Rico. Miguel Fernández, PhD: Miguel serves as NatureServe’s Director for Latin America and the Caribbean and a KBA Regional Focal Point for Latin America. Miguel earned his Master’s degree from San Francisco State University in Geography and his PhD in Environmental Engineering from the University of California. His background includes positions at the Group on Earth Observations Biodiversity Observation Network (GEO BON), where he served as the lead developer of the Essential Biodiversity Variables, currently being applied in Europe, Asia, and Latin America, as a guiding principle for national monitoring initiatives. At the United Nations Development Program (UNDP), Miguel pushed forward new environmental regulations for mining and petroleum activities in South America. He has also held positions in IUCN and the Intergovernmental science-policy Platform on Biodiversity and Ecosystem Services (IPBES). All will engage with the audience to comment on and answer questions. Please RSVP by return email to Debra (dzanewich@worldbank.org) and Ariel (Ariel.Cuschnir@mottmac.com) if you plan to attend to enable us to prepare appropriately. If you will attend, be sure to bring valid US government-issued identification. If you would like to participate, but cannot attend, please let us know so that we can provide WebEx connection details. Arlene Fleming, MA, MPS: Arlene is an archaeologist and specialist in cultural heritage documentation, conservation and management. She has served for two decades as consultant to the World Bank, advising on investment lending and safeguarding cultural heritage in Bank-financed projects. Her work has included authoring policy documents and reports, training Bank staff, consultants and clients, and serving as liaison between the Bank and cultural heritage organizations. She is founding co-chair of the IAIA Cultural Heritage Section. Gregory Lockard, PhD: Greg is a professional anthropologist and cultural heritage specialist with training and experience in social work. From 2008 to 2010, he served as the lead cultural heritage specialist for the $3.8 billion PERU LNG Project, which involved the construction of a natural gas pipeline, liquefaction plant, and marine terminal in Peru. He currently works for the consultancy ERM, at which he serves as an environmental and social consultant managing and working on international projects, especially in Latin America and the United States. His work at ERM focuses on environmental and social impact assessments, environmental and social due diligence, and monitoring compliance with environmental, social, and cultural heritage lender requirements. Christopher Polglase, MA, RPA: Chris is an archaeologist with nearly 40 years of professional experience in archaeological excavations, historical research, and applied cultural heritage studies. He directs Gray & Pape, Inc.’s Cultural Heritage Practice and has wide-ranging experience, having managed projects and conducted investigations throughout Europe and the Caucasus, the Continental United States and Alaska, Central America and Caribbean, and Africa. Mr. Polglase currently is Co-Chair of the Cultural Heritage Section of IAIA and a Technical Advisor for Leaders in Energy and Preservation. 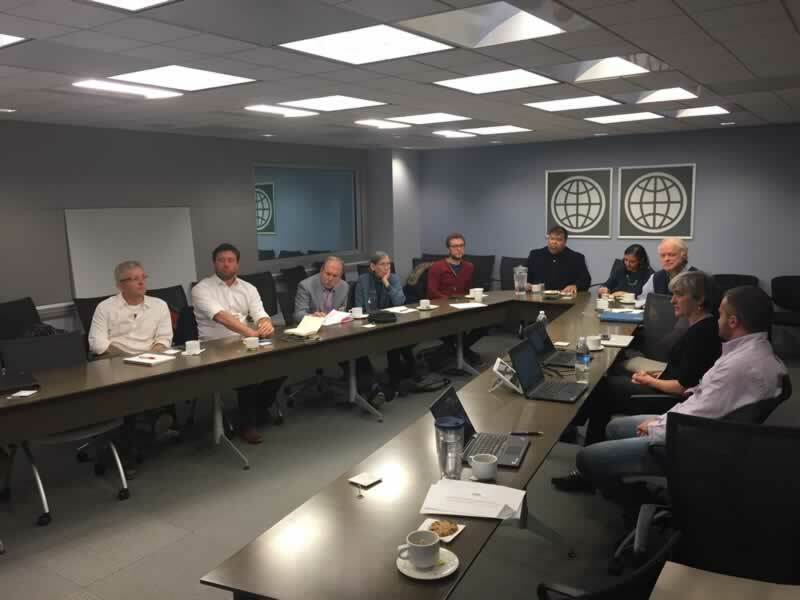 He also is part of a working group (along with Arlene Fleming) convened by ICCROM and IUCN to develop a tool kit and training related to cultural heritage and impact assessment as part of the World Heritage Leadership Programme. After a long summer break, we are starting off the Washington Area Branch (WAB) of the International Association for Impact Assessment (IAIA) with an informal happy hour on Tuesday, October 30th at the Taberna del Alaberdero (1776 I Street NW, the entrance is on 18th Street NW). People will trickle in 5:15 onwards. There is no reservation for WAB so first come, first seated! Everyone will pay their own way. We look forward to catching up with you and to identifying potential speakers for upcoming sessions. As a start, we have interest for sessions to be organized on the following topics: legacy land issues and compensation, biodiversity, contractor management (including influx management). We now need to identify potential speakers for these topics – are you interested?? Are there other topics you’d like WAB to cover this year? Questions? Suggestions? And of course, please check out the variety of impact assessment related resources available at www.iaia.org and also take the opportunity to renew memberships or join IAIA. You’ll also find information on the next annual conference – IAIA’19 in Brisbane, Australia. We hope to see you at the Happy Hour on Tuesday. If you aren’t able to make the Happy Hour and are interested in sharing your experiences at a WAB session, please send Ariel and me an email. The Role of Independent Accountability Mechanisms (IAMs) in International Finance June 13th, 2018 from 3.00 – 5.00 pm in Room U12-250, MIGA, “World Bank U Building”, 1800 G Street, NW, Washington DC. International Financial Institutions (IFIs) provide financial support to development projects across the globe. Governed by standards that regulate environmental and social performance, these IFIs work with government and the private sector in difficult contexts where project impacts may result in unintended social and environmental harm. In response to growing demand for accountability and the need for impacted communities to access non-judicial recourse, IFIs has established independent accountability mechanisms (IAMs) mandated to receive complaints from communities. These complaints raise issues of environmental and social impacts and the IAMs use dispute resolution and/or compliance investigations to address these impacts. Briefly introduce IAMs to WAB audience, including website for the IAM network <http://independentaccountabilitymechanism.net/>. Present the use of dispute resolution and compliance reviews, as a practical approach to obtaining environmental and social justice in challenging contexts. What are the policies that govern your IFI’s activities regarding environmental impacts? What is the relevance of accountability in the context of environmental justice? What are some of the tools available to practitioners in the impact assessment space that could help reduce conflicts around development projects? How can communities, private sector and governments work together to assess environmental harm and mitigate negative environmental impacts? Please RSVP by return email to Debra (dzanewich@worldbank.org) and Ariel(Ariel.Cuschnir@mottmac.com) if you plan to attend to enable us to prepare appropriately. If you will attend, be sure to bring valid US government-issued identification. If you would like to participate, but cannot attend, please let us know so that we can provide WebEx connection details. IAIA 2018 Annual Conference - was held in Durban, South Africa on May 16 – 19, 2018. To access draft papers of the contributing authors at the Conference: http://conferences.iaia.org/2018/draft-papers.php. Final papers corresponding to these drafts will be posted in July 2018. We hope you will join us on Wednesday June 13th 2018! WAB hosted its first session on the topic of use of security forces in private sector projects and the concept of fragility. Using Performance Standard 4 as the basis, the speakers shared some experiences on the requirements of companies to i) assess the security risk their operations may have or could create for communities; ii) develop ways to manage and mitigate these risks; iii) manage private security responsibly; iv) engage with public security; and v) consider and investigate allegations of unlawful acts by security personnel. Performance Standard 4 applies to companies of any size and in any country or sector. Discussion also included the Voluntary Principles on Security and Human Rights. Felicity Kolp, Social Development Specialist at the International Finance Corporation (IFC). Felicity focuses on a range of social topics (including use of security forces) and is a focal point for human rights issues. At the WAB session, she introduced IFC's Good Practice Handbook on Use of Security Forces: Assessing and Managing Risks and Impacts: Guidance for the Private Sector in Emerging Markets. J.J. Messner, Executive Director at Fund for Peace (FFP), explained the concept of fragility and explored contextual risk. J.J. has co-directed the FFP's Fragile States Index since 20122. He is a long standing Board Member of the international Voluntary Principles on Security & Human rights Initiative. 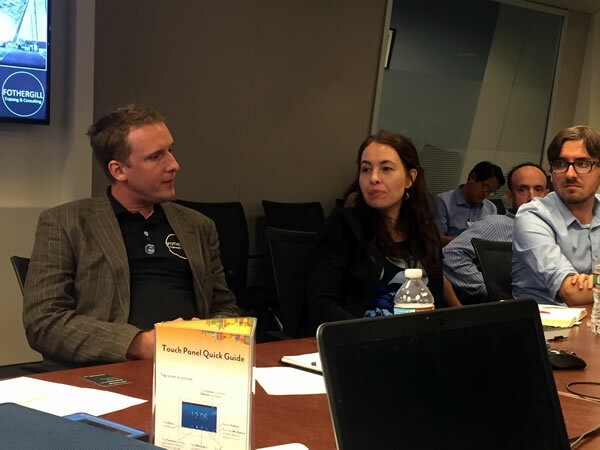 Krista Hendry, Chief Operating Officer at Monkey Forest Consulting, fielded questions regarding use of security forces and provided some case examples. Krista has helped numerous companies develop policies on human rights, stakeholder mapping, indigenous rights, and security. FOR IAIA MEMBERS IN THE WASHINGTON, DC, USA AREA. IAIA members can check out WAB on IAIAConnect. 3. Directive’s new expectation that EIAs are undertaken by competent experts. Josh Fothergill is the Policy Lead for: Impact Assessment and Circular Economy & Skills for Sustainability at IEMA and is also the Founder & Director of Fothergill Training & Consulting Ltd. He has led UK EIA practice for the last decade through his role at IEMA, a UK based not for profit environment and sustainability professional body, co-authoring 15 EIA related guides and briefings and running well over 150 workshops & webinars. Josh is currently leading a project, funded by an IAIA research grant, exploring how different national professional recognition schemes for individuals undertaking EIA operate around the world. Jo Murphy is the National Technical Manager for the National Environmental Assessment Service (NEAS) in England’s Environment Agency, as well as being CEO of Fothergill TC Ltd, and an Associate Academic at the University of Derby. Through this role, Jo sets the professional accreditation and training requirements for a team of ~80 IA professionals and acts as the highest level of advice on matters related to project and strategic IA within the Agency. In a voluntary capacity, she has been a member of IEMA’s eight person Professional Standards Committee four years, including modernised the institution’s professional grades to incorporate sustainability. The Washington Area Branch (WAB) of IAIA held its May 2017 meeting with two speakers sharing their experiences related to managing labor influx and large workforces. Approximately 25 people attended in person with another 15 participating via webex. Qays Hamad– Qays is part of the Policy Compliance and Grievance Redress Operations Policy and Country Services Team at the World Bank. He is one of the lead authors of the World Bank's recent guidance note on Managing the Risks of Adverse Impacts on Communities from Temporary Project Induced Labor Influx http://pubdocs.worldbank.org/en/497851495202591233/Managing-Risk-of-Adverse-impact-from-project-labor-influx.pdf. 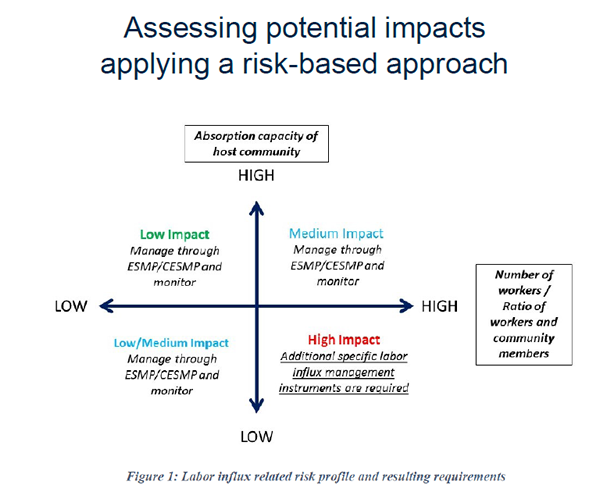 Qays spoke about identifying and managing potential impacts and risks from project induced labor influx, using as a case study some challenges the World Bank faced on a recent project in Uganda. Below is a link to the Inspection Panel Case Study for the Uganda Transport Sector Development Project. Through this link, all the Inspection Panel related documents can be found, including a link to the Influx Management Guidelines (see the list of documents on the bottom right corner). Josefina Doumbia – is a Principal Environmental Specialist at the IFC. Josefina spoke about the challenges of managing workforce challenges associated with large mega-projects. She used as a case study the construction of a polypropylene complex in the State of Veracruz, Mexico. She focused on managing a large multicultural workforce, with many unskilled workers and a strong presence of unions. Despite these challenges, the project achieved high performance, using Health and Safety statistics as an key indicator. See her attached presentation. Atia Byll-Cataria, Environmental and Social Development Specialist (MIGA), focused on sharing experiences related to applying Performance Standard 5 (PS 5) before and after a conflict situation. In 2012, MIGA provided guarantees for the construction of the Henri Konan Bédié (HKB) Bridge in Abidjan, Cote D'Ivoire. The Project commenced resettlement and compensation of affected households and businesses in 1998. In December 1999, however, when resettlement was almost complete, political events and civil conflict forced construction to be suspended indefinitely. Over a decade later, once, the situation in the country had stabilized, and the project recommenced. This case study describes how the civil conflict and the associated interruption in the development of the Project potentially affected the ability of the Project to implement a Performance Standard (PS)- compliant resettlement and compensation program. This case study was recently presented at the IAIA Special Symposium on Resettlement and Livelihoods held in Manila in February 2017. Gordon Appleby, Independent E&S Consultant (World Bank, 1992-1999), shared his experiences with resettlement in a donor-financed irrigation project in Mali and in a private-sector mining operation in DRC. Kate Wallace, Sr Environmental and Social Development Specialist (MIGA), covered retroactively applying PS 5. In 2014, MIGA provided a guarantee for the upgrade of National Highway 20 in Vietnam. Resettlement and compensation for the project commenced in 2013 – prior to MIGA engagement in the project. This case study described the initial approach taken by the District Land Development Departments, the issues identified by MIGA and then the steps taken to address and retro-actively ensure compliance with MIGA's Performance Standard 5 Land Acquisition and Involuntary Resettlement (PS 5). This case study was recently presented at the IAIA Special Symposium on Resettlement and Livelihoods held in Manila in February 2017. 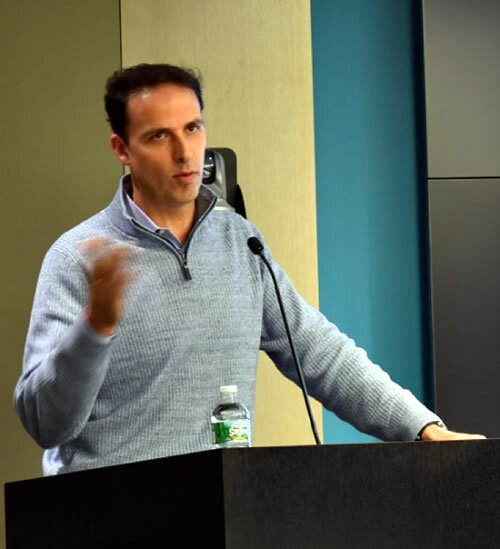 Sven Muller, ‎Senior Advisor for Renewable Energy and Sustainable Infrastructure at the Inter-American Development Bank, spoke on integrating sustainability into large infrastructure projects. 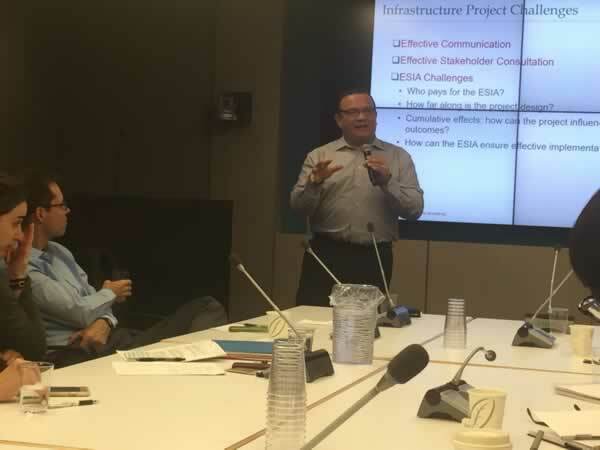 Ricardo Calvo, Partner with ERM, shared lessons learned in managing environmental and social risks for large infrastructure projects. 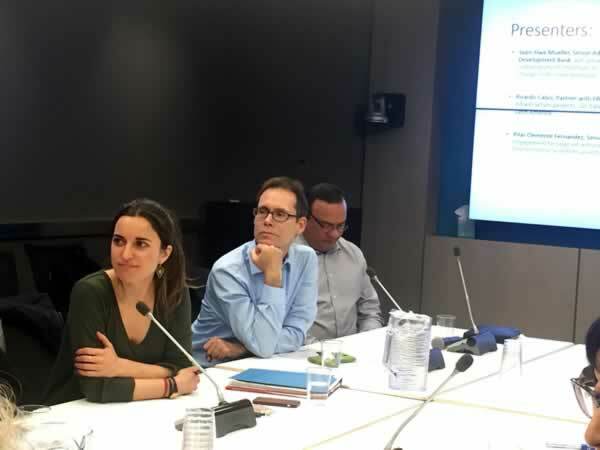 Pilar Clemente Fernandez, Senior Environmental Specialist at the World Bank, focused on managing stakeholder engagement for large infrastructure projects using the Panama Canal Expansion as a case study. Davis, Rachel and Daniel M. Franks. 2014. "Costs of Company-Community Conflict in the Extractive Sector." Corporate Social Responsibility Initiative Report No. 66. Cambridge, MA: Harvard Kennedy School. Dan Peters, Director of the Office of Development Results and Accountability at the U.S. Department of Treasury, discussed the Treasury Department's role in the review and approval of MDB projects as well as Treasury's engagement with the MDBs on their environmental and social risk management policies. He also highlighted some emerging trends and challenges, followed by an exchange of insight and views by WAB members. His presentation is available here. Pablo Cardinale, Principal Environmental Specialist at the International Finance Corporation (IFC) presented on IFC's approach to management of cumulative impacts potentially resulting from multiple cascading hydropower in critical aquatic habitat due to the presence of the CE Kashmir Catfish and the EN Golden Mahaseer, and how a project's Biodiversity Action Plan (BAP) has been elevated to guide a Biodiversity Strategy to manage potential cumulative impacts at a landscape level. His presentation is available here and the Cumulative Impact Assessment report is available here. Happy Autumn and welcome to the 2016-17 season of WAB Events. The presentation will be made by Stephen F. Lintner who is serving as the Senior Environmental and Social Advisor to the Asian Infrastructure Investment Bank. Stephen is a former President of the IAIA and was the Co-Chair of the Asia Day Forum held during our Annual Conference in Nagoya this May. Although advance registration is not required for visitor’s entry to MIGA’s office (please bring valid government issued ID! ), please RSVP by return email if you plan to attend so that we can prepare appropriately. We plan to broadcast the meeting live (but not record), so let us know if you need the WebEx access code. Thank you for sharing this announcement with colleagues who may be interested in the topic. For the first time in several years, the Washington Area Branch (WAB) returned to the key topic of Climate Change. Some three dozen IAIA-WAB members and friends participated in the two-hour session, which was convened at the offices of MIGA, and webcast to participants in several locations and countries. This meeting was a joint effort of WAB and the Climate Change Section, which, with 160 members, is IAIA’s on-going forum for IA practitioners to exchange expertise and knowledge on climate change across all areas of IA. WAB, with IAIA and the World Bank, had organized a Special IAIA Symposium on Climate Change and Impact Assessment in November 2010. A year later, we devoted a session to updates from the Symposium and initial activities of IAIA’s Climate Change Section. But despite continued widespread interest, it has taken until now to again organize a session on the topic. Meanwhile, the topic of climate change and impact assessment (CCIA) has become even more timely with recent Paris climate change agreement, and dedication of IAIA’s 2017 International Conference to the theme of Impact Assessment’s Contribution to The Global Efforts in Addressing Climate Change. In mid-May, just a week following our May 4th session, at IAIA 16 in Nagoya, Japan, the Climate Change Section would convene what has become an annual roundtable on the topic. So the intention was to engage both the WAB membership and Washington-based development agencies, rekindle discussions begun at the Symposium in 2010, and begun building awareness and momentum for future efforts, including IAIA 17. WAB members and friends are strongly encouraged to review the submission guidance and, if interested, submit proposals to IAIA. The deadline for Session Proposal submission is coming up quickly, June 30 of this year! The paper and poster abstract submission deadline will be the 31st of October. Wes Fisher, of The Cadmus Group, and co-chair of IAIA’s Climate Change Section, provided the opening presentation, based on his report to the up-coming IAIA Climate Change Roundtable in Nagoya. He quickly reviewed the history of IAIA’s involvement in the topic over the past half dozen years, the increasingly central role that climate change is playing in considerations of planetary boundaries, and key issues that have emerged from on-going discussions within the Climate Change Section and the annual IAIA climate change roundtables. Climate change scientists and both governmental and private stakeholders are still relatively under-aware of the potential for EIA/SEA processes to contribute to addressing climate change challenges. So new and additional efforts are needed to reach out to and engage the climate science community and investment/risk managers. At the same time, effective applications of EIA/SEA and CEA tools and approaches to climate change decision-making processes need to be identified and highlighted, and opportunities for joint climate change and impact assessment need to be encouraged. (See IAIA CC and IA Follow-Up Next Steps, Draft, 15 April 2016, for discussion at IAIA-16). 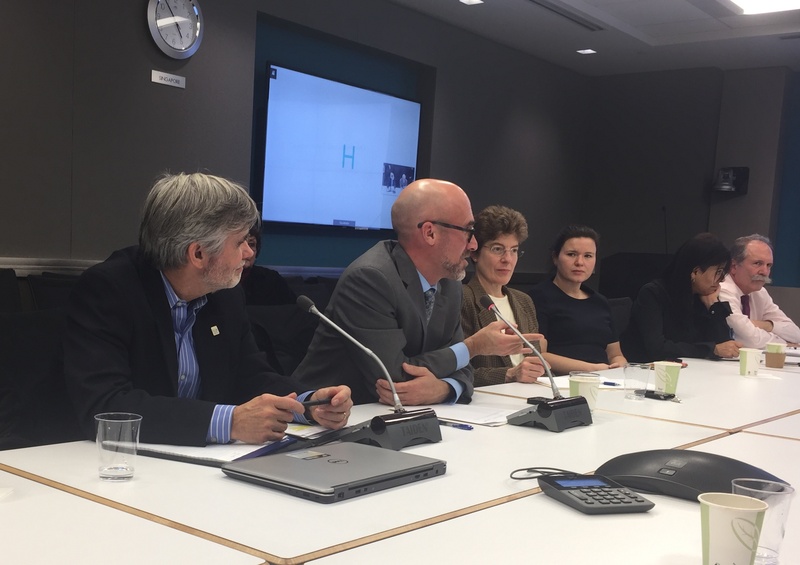 CCIA is integral to the thinking of each of these agencies, and several – IDB, World Bank, and IFC – are in the process of up-dating their environmental and/or climate change guidance. The World Bank has just, in mid-April, released its new Climate Action Plan, committing to major efforts on both mitigation and adaptation. ExIm’s efforts have focused on appropriate consideration of new coal-fired power plant investments. MCC works pro-actively with other federal agencies in screening activities for climate risks, while relying on its environmental and social assessment procedures and building climate change adaptation and mitigation into programs where possible. Several members of WAB and the Climate Change Section have been considering the possibility of a follow-up symposium in Washington to the 2010 event. There was good discussion of the costs and resources that were needed for the 2010 event, and the need to assure that follow up and sponsorship efforts are addressed. There was general agreement that near-term efforts will necessarily focus on the IAIA ’17 conference. Climate Change and Impact Assessment will surely continue to evolve as an interest of WAB/IAIA members. New tools and guidelines related to climate change will provide opportunities for future WAB presentations and Climate Change Session webinars. For now, some of the key references used or mentioned during the May 4th meeting are listed below. In addition to reviewing recent experience from on-going assessments of wind power projects in Central and South America, this two-hour session focused on lessons learned and advances in good industry practice, including key changes in the recently updated IFC’s Wind Energy EHS Guidelines, and the biological basis for bird and bat monitoring protocols. Justin Pooley and Lori Anna Conzo summarized the changes made in the recently updated World Bank Group EHS Guidelines for Wind Energy in their presentation: EHS Guidelines Update - Wind Energy. 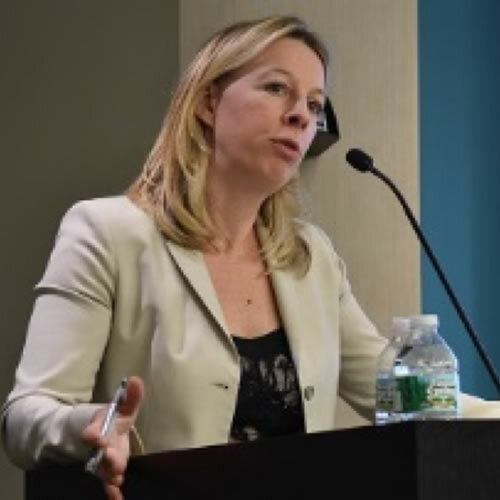 Lori Anna Conzo is a Senior Environmental Specialist and Biodiversity Focal Point in the Environment, Social and Governance (ESG) Department of the International Finance Corporation (IFC). As Biodiversity Focal Point, Lori works across the regions and sectors on biodiversity-related issues, with a focus on the infrastructures and renewable energy. Justin Pooley is a Principal Specialist in IFC’s Environment, Social & Governance Department and the department’s global sector lead for power projects. Justin has worked on wind projects in multiple regions and was one of the core IFC team involved in updating the WBG Wind Energy EHS Guidelines in 2014-15. Marianela González reviewed the field experience and results of field monitoring of bird and bat impacts of several wind power projects in Central America in her presentation: Bird and Bat Monitoring: Experiences from a Private Wind Power Producer. Marianela González is Environmental and Social Compliance Coordinator at Globeleq Mesoamerica Energy. She has nearly a decade of experience in environmental and social management of renewable energy projects, including compliance with local legislation and IFC’s / MIGA’s Environmental & Social Performance Standards and Good International Industry Practices for wind and solar energy projects in Costa Rica, Panama, Nicaragua, Honduras, Guatemala, Mexico, and Chile. 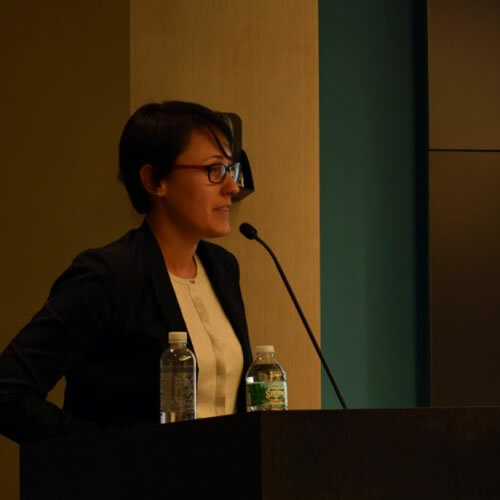 Genevieve Beaulac presented very recent findings from IDB wind power projects in Oaxaca, Mexico, and Latin America – following up on her September 2014 WAB presentation, Wind Energy in Latin America, Challenges and Solutions. Genevieve Beaulac is a Senior Environmental Specialist at the Environmental Safeguards Unit of the IDB, responsible for the design, implementation and monitoring of projects in the energy sector (wind, geothermal, hydroelectric and transmission lines. Caleb Gordon reviewed broad data and biological theory in his presentation: Wind-Wildlife Issues in Latin America – Biological Perspectives. Caleb Gordon, an ornithologist and wildlife ecology with WEST, Inc., has managed wildlife research and impact studies for IFIs and private developers on energy projects in Uzbekistan, Honduras, Costa Rica, Mexico, and Nicaragua. Caleb has particular interest in offshore wind-wildlife studies. 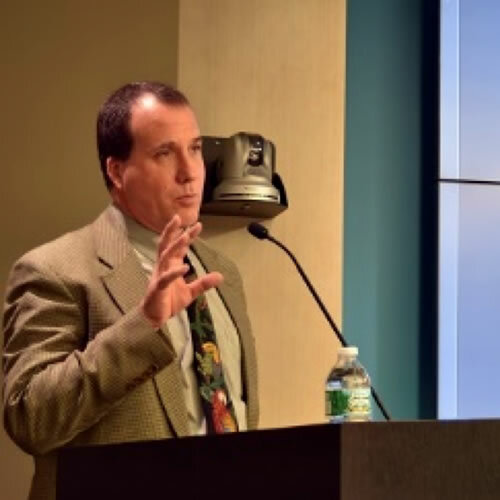 In this area, he has managed four large research projects for the Bureau of Ocean Energy Management (BOEM, USDOI), has given numerous presentations at scientific, government, and commercial conferences, and has served as wildlife issues subcommittee chair of the American Wind Energy Association’s (AWEA) Offshore Wind Workgroup (OWWG). 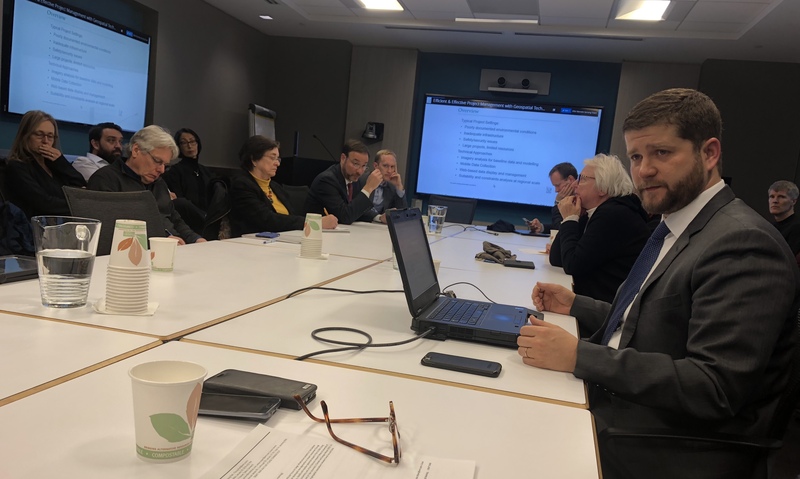 Raymi Beltran of IFC, and Charles Hernick of The Cadmus Group, jointly presented their recent work in Assessment of Biodiversity, Critical Habitat, and Ecosystem Services – Recent Experience from Africa and Latin America, with Reference to the IFC Performance Standards. IFC's Performance Standard (PS) # 6 has become a benchmark for the investment community on the topic of biodiversity management. The first presentation will walk through some of the fundamentals of PS6 and its interpretation. The session will also go into a review of the key deliverables to reach PS6 compliance and practical examples of how to conduct a Critical Habitat Assessment for private sector projects. PSs 1, 4, and 6 require that impact assessment account for and identify ecosystem services, defined as the benefits people derive from ecosystems. The second session will build on the first by focusing on ecosystem services and the challenges and opportunities associated with ecosystem service analyses in the impact assessment process. A case study from Tanzania will be used to illustrate trade-offs and potential value added, especially in scoping. Raymi Beltran is a Senior Environmental Specialists with IFC's Oil, Gas and Mining Group. He has over 15 years of experience in environmental and social management working on oil, gas, mining and infrastructure projects in Latin America, Asia and Africa. As part of his current position, Raymi works closely with private sector companies in assuring compliance with IFC's Environmental & Social Performance Standards and adopting Good International Industry Practices for their projects. Prior to joining IFC, Raymi was the Environmental Manager for Kinross Gold based in Santiago, Chile, and prior to this, he was the Environmental and Community Affairs Manager for the PERU LNG Project in Peru. Charles Hernick is a Senior Associate at The Cadmus Group, Inc. He is an expert on USAID environmental safeguards/compliance and tropical forestry and biodiversity assessments. His recent projects include environmental impact assessments and tropical forestry/biodiversity assessments in Latin America, the Caribbean, and Africa. He has managed extensive policy and environmental finance research, and he designed the U.S. policy for mitigating the financial risks associated with the geologic sequestration of carbon dioxide (i.e., polluter pays principle/financial assurance). “Challenges to Performing ESIA and Implementing Projects in Liberia” – Presentation by Heather Boyd, Acorn International, LLC, and Wassim Hamdan, Earthtime. Ongoing Developments in Satellite Remote Sensing for Environmental and Social Impact Assessment: focussed on new technology solutions and how they can contribute to impact assessment and monitoring. This presentation was given by Gordon Campbell (European Space Agency) and Anna Burzykowska (World Bank). Branches are responsible for their operating structure and activities, and operate separately and independently of IAIA. IAIA is not responsible or liable for the actions or activities of the Branches.